Rodent Pest Control in Your Yard - Yes Pest Pros, Inc. Rodent Pest Control in Your Yard - Yes Pest Pros, Inc. When you think of rodents, rats and mice likely come to mind first. These are certainly common pests who have caused more than their fair share of calls to rodent pest control companies. However, there are more rodents that fit the title of “pest” just as well. Moles, voles and even squirrels can create serious rodent pest control problems. 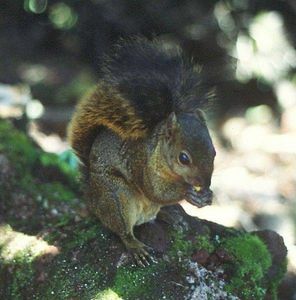 Squirrels are probably the cutest member of the rodent family. Their fluffy tails and comical behavior usually earn them favorable treatment from humans. Most homeowners don’t consider them a pest control issue, but they quickly can become a nuisance in the wrong place. Squirrels are known for their excellent climbing abilities. They can scale a tall tree in seconds. They can also scale the wall of your home right up to the roof with ease. There, they might just find an easy way inside your attic where masses of comfy insulation will look like an inviting nesting site. Ask anyone who has been kept awake all night by squirrels scurrying in their ceiling – they aren’t so cute anymore! Make sure your attic is sealed with tightly fitting screens to keep squirrels out of your eaves and attic. Have your rodent exterminator check for any evidence of squirrel inhabitation on his next visit. These pesky tunneling varmints can ruin a lawn pretty quickly if left unchecked. The can also leave hard-to-spot holes that can trip you up and lead to injured legs and ankles. These little pests are active all year long and so they can do a lot of damage with their burrow and tunnel building. The main runway and mound can be difficult for a homeowner to locate on your own so you may need to call in a residential and commercial pest control expert. Their tunnels run around six inches below ground and can extend into neighboring yards as well as your own. Your rodent pest control professional can use bait or other means to get rid of lawn destroying moles. A vole is a stocky looking rodent often referred to as a field mouse or a meadow mouse. They are prolific breeders and stay active all year long. This means they do not hibernate and thus are foraging for food in every month and every season. They can be especially problematic for farmers and home gardeners since they can destroy a crop or a harvest in short order. Bait may be the answer to a vole infestation, but leave this technique in the hands of a professional pest control agent. He can help you find the right solution that will not be harmful to your pets or children. Treating for rodents should be part of your integrated pest management system. Talk to your Elkhart pest control professional at Young Environmental Solutions about how you can keep your home and lawn free of all types of rodents.